The New York Times profiles an Upper West Side fixture. We recently highlighted New York Times writer Corey Kilgannon’s chronicling of the Silver Gull Beach Club in Queens. The article series launched over the July 4 holiday weekend and, coincidentally, that date figures comically in Kilgannon’s newest report. 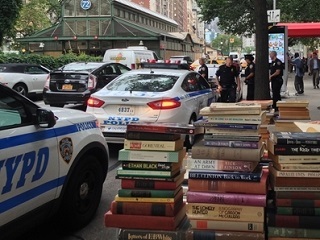 In July, the NYPD started their latest crackdown, deploying a team of officers and trucks to seize books from 10 tables on the block, which included a couple of tables kept by smaller vendors. Officers issued Mr. Davidson a summons for leaving more than 2,000 books unattended on the sidewalk. Davidson, a wily Army vet who got the latest summons dismissed on a technicality, told Kilgannon that over the years, settlements of his counter-suits against the city have totaled around $80,000. A new law may eventually put an end to his First Amendment loophole, but he jokes that by that time he will be retired. Davidson’s battles have long been documented in other publications as well such as DNAInfo and Westside Rag.